So, here are our two girls. They are a year old now and fully trained and well behaved. Okay, maybe not that well behaved or trained, although they know lots of words: treat, sit, down, stay, wait, bye-bye ,dinner, breakfast, come, leash on, leash off, rabbit, outside, potty….well you get it. They are a joy and will be joining us in our RV on our around the US and Canada trip next May. 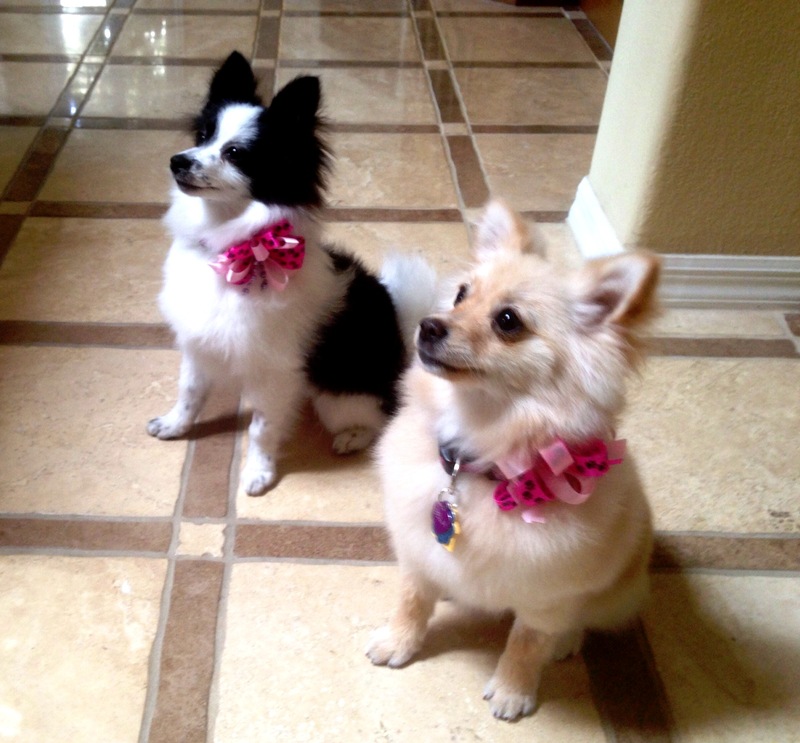 Maybe I will call it, “Traveling with two Pomeranians in a RV and hunting Treasure”. We will be looking for Forrest Fenn’s treasure as we travel through the states where it is reported to be. (Montana, Wyoming, New Mexico) There might be a couple of other states, but those are the ones where we think it might be. If you are interested in treasure hunting, go to: dalneitzel.com. You will find oodles of information about the treasure and about the book, Thrill of the Chase, written by the man who hid the treasure, Forrest Fenn. You won’t find a more interesting story and treasure hunt in modern day time than this. He is quite the character, a self-made man who served in the Air Force and then became the owner of an art Gallery in Santa Fe, New Mexico. To make a long story short, he contracted prostate cancer and beat it, long before all the new medications came out. He then decided to share his love of the outdoors with others, so he hid a bronze treasure chest full of gold and jewels and treasures, somewhere north of Santa Fe in the mountains above 5,00 feet. It can be found by following nine clues he wrote into a poem. The trick is…deciphering the poem! We have joined the search, but no luck yet. Of course everyone thinks they can figure out what the poem means, but no one has just yet. We will be hunting again next summer, as we travel around the US. I have some new thoughts on deciphering the poem, so we will see. We have only hunted in Yellowstone, but this year I think we will make a stab at it in New Mexico, land of enchantment! The real fun is in the hunting. It gets you outside doing things you might not usually do, like facing off with a herd of buffalo. Yes, we did do that and I had to take off my red jacket! We hope you will follow our journey next year and maybe even meet up with us along the way. Why the Treasure Chest is Hidden in New Mexico. Lots of hunters think the treasure chest in hidden in New Mexico because it is closer to Forrest’s home. They have, as we all do, justified the clues in the poem to fit the area. It could be, but I am not of that opinion. I still think Forrest hid it near where his heart was in his boyhood. Near or in Yellowstone Park. I’m now opting for near as the more I think about a Federal Park and the rules and regulations associated with it, the more I think it is nearby. This summer is going fast and I have to get up there soon to prove my point! Well, winter is coming and I don’t really see a way we will be able to hunt again until spring. If I thought it was in New Mexico, maybe there could be another attempt at it, but I think it is in or near Yellowstone. So, we will have to wait and plan for spring. It is an exciting adventure to look forward to. Thanksgiving will soon be here and I we will have it with our family at our son’s home. What a relief to not have to do all the stuff at our house now. The new generation does take over and that’s a good thing. Funny, you don’t often think about age, but when these changes happen, you remember back to when you took over the festivities and suddenly realize that time does just fly by. Make each day count and don’t waste time thinking about if you should or should not do it….just do it and never have regrets. Forrest contemplating how to upstage his contemporaries. Forrest’s grandson introducing Forrest, Douglas and Michael. Preparations are being made to leave for Santa Fe New Mexico and Forrest Fenn’s book signing on October 22nd. We have yet to meet him and are looking forward to it. In addition, there will be two guest authors, Douglas Preston and Michael McGarrity. How exciting can that be? We have never been to Santa Fe, so I have a list of places we want to visit including the Loretto Chapel which sits at the end of the Santa Fe Trail. It contains a staircase said to be miraculous, because it was constructed with only wooden pegs. No glue or nails were used. It has two 360 degree turns and no support except its base. It has confounded architects for years and is thought to have been built by or inspired by St. Joseph. In addition, we will scout the area for any signs of the treasure. Maybe Taos? Who knows. I have yet to decipher any clues pointing that direction, but you never know! It doesn’t matter as we will be enjoying the Thrill of the Chase yet again. If any of you other treasure hunters will be there, please say hello.